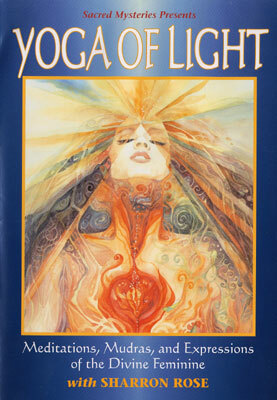 In this elegant and enlightening presentation, award winning author, educator and performing artist Sharron Rose introduces the feminine based Yoga of Light, an ancient science and spiritual practice of physical and spiritual revitalization. Rooted in her extensive research and first-hand experience in women's mysteries and the mystic arts of Tantra and Alchemy, Ms. Rose introduces a system of yogic training based upon the unique dynamics of the female energy field. This consists of meditations for relaxation and stress reduction, visualizations for cleansing, restoring and protecting the physical body and luminous energy field that surrounds it, mudras (sacred gestures) designed to depict the flow of subtle energy through the luminous field, and exercises to enhance visionary capacity and align women with the most powerful and profound feminine role model - the Great Goddess. Segments include; Yoga of Light, Cleansing the Luminous Body, Igniting the Inner Fire, Awakening the Serpent Power, Opening the Heart and Healing the Luminous Body.